So here we are on the home straight…finally!! We are set to open our very first US showroom at 28 Bond Street, New York next month in early April. As I type, the very last shipping container (for now) is on its way across the pond with the worktops and a selection of our most loved and precious antiques. 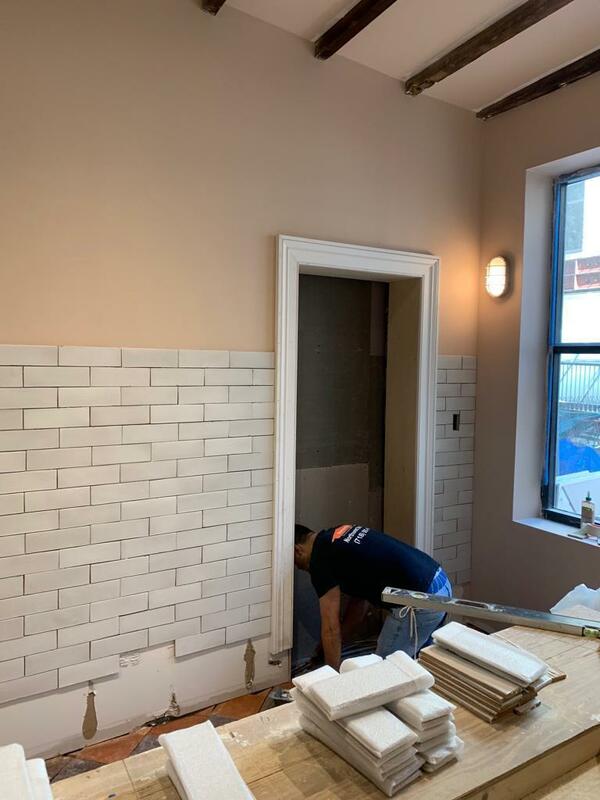 The colours are on the walls, the tiles are up, furniture is being expertly fitted, the lights are in, there’s a working loo! Those of you who have been through a renovation project will know the sheer delight you feel with these little “milestones”. Our new home in NoHo, New York, all boarded up but lots going on inside!! 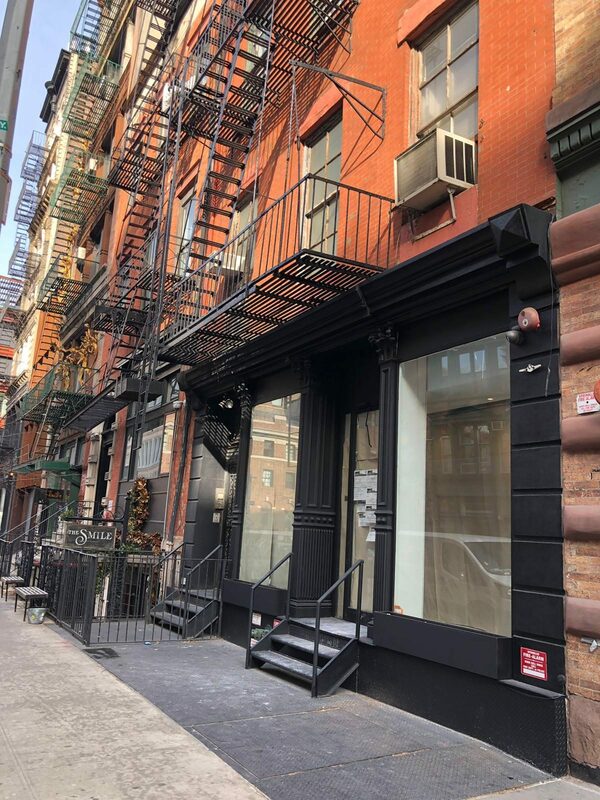 Our new home is a mid-19th century building on Bond Street in the NoHo area of East Village. It’s a wonderful location with tree-lined streets and a sense of calm, a little alternative with independent shops and restaurants giving it a neighbourhood feel rather than a big city vibe, kind of like Clerkenwell. We love this, we’ll always be drawn to the places where there’s a sense of community and life is a little slower and more chilled out. 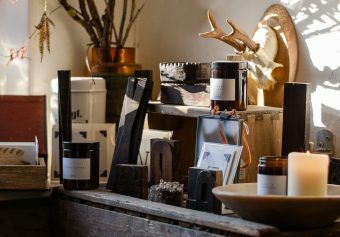 And we’re in pretty good company – the always inspiring John Derian has a shop just down the road, Gwyneth Paltrow’s Goop is opposite, and the street itself is home to some big name celebs. How crazy, a kitchen shop from a little village in the middle of England mingling with the A-listers…who’d have thought it?! We’re so excited to become part of Bond Street’s impressive history. 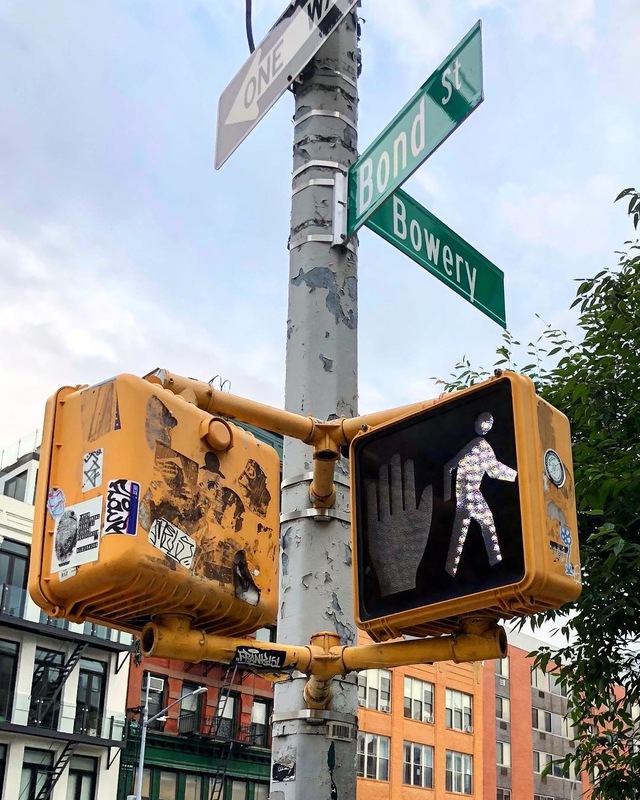 The corner of Bond Street and Bowery, East Village. What a cool neighbourhood! In true New York-style, the building is thin and very long!! It’s over 22 metres from the front door to the patio at the back. This presented new design challenges in itself. We knew we wanted to showcase all four of our beautiful ranges as well as the versatility of these humble cupboards. So Helen and Paul and the team had to decide how to break up this big, long room to feel like four different kitchens. We wanted each of these displays to have a different feel but also loved the idea of being able to stand at the door and look straight through to the little garden at the back. The solution is a very cool Crittall-style window, partitioning the space but without obstructing the view. It sits between the Shaker and Haberdasher’s display, painted in mustard yellow and varnished with a unique crackle glaze, you would never guess it was just a few weeks old. 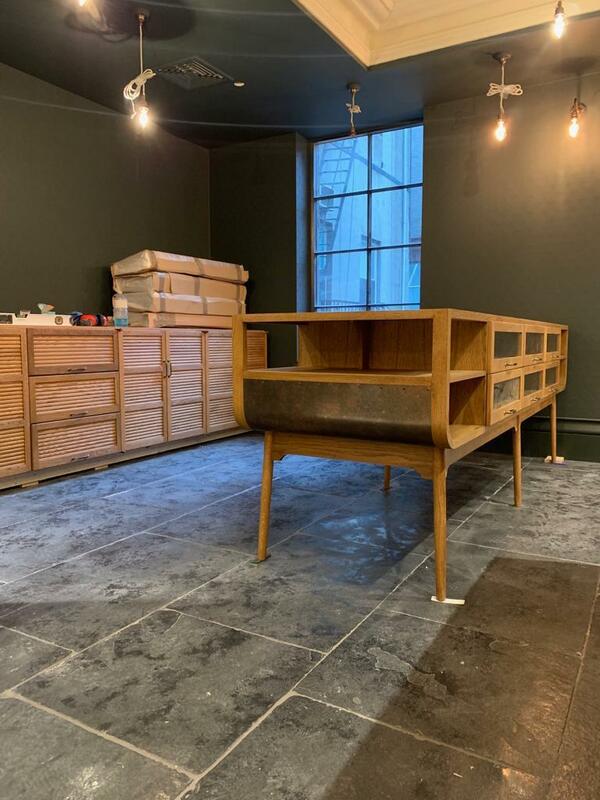 Forget shiny and new, that’s not really our style, this showroom will be full of character, imperfectly perfect with a story to tell. It will be like discovering a little bit of old England in the middle of Manhattan… and that to us is super exciting!! A peek inside the new Shaker Kitchen – a beautiful mix of mustard yellow and ‘Lead’ grey. 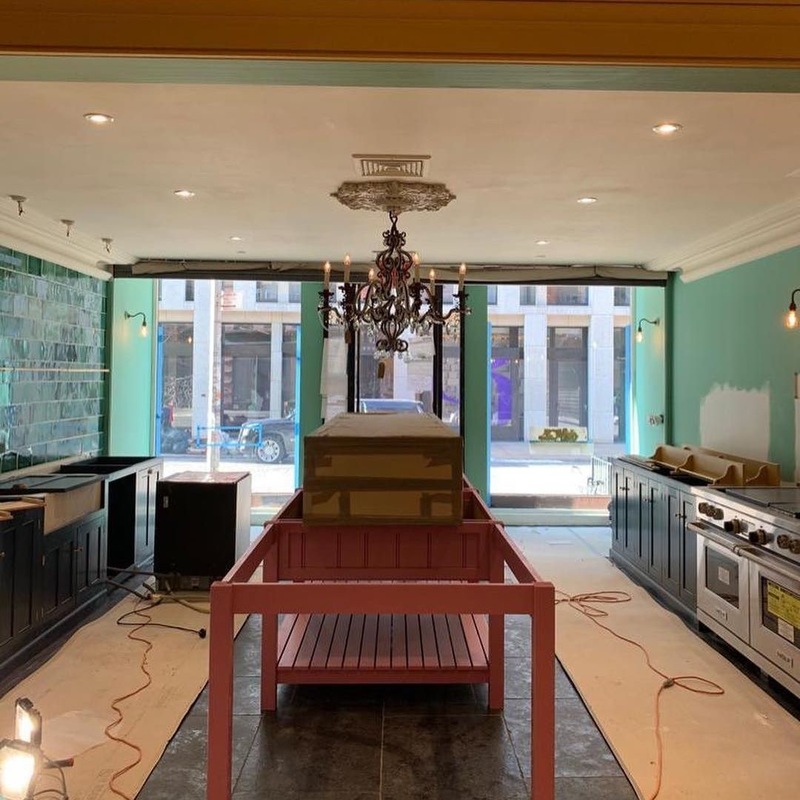 Expect an interesting and unusual mix of colour: deep blue, lead grey, mustard yellow, arsenic green, oh and pink – yep, the Classic showroom will include a huge pink island! It’s a little out there, but Helen has always loved pink and if I’ve learnt anything over the past four years working here it is to always trust her styling judgement, she just knows what will look cool. When she said she wanted to paint the ceiling of our St. John’s showroom green I have to admit I had my doubts, especially with pink walls, green tiles and blue cupboards, but it just works and has now become one of our most iconic kitchens ever. 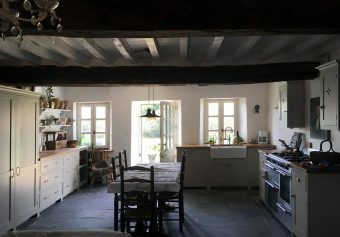 I can’t wait to see this island topped with a combination of honed black granite and highly polished copper, laden with pots and pans and plates. We always say if you love something go for it, and that’s exactly what Helen has done. 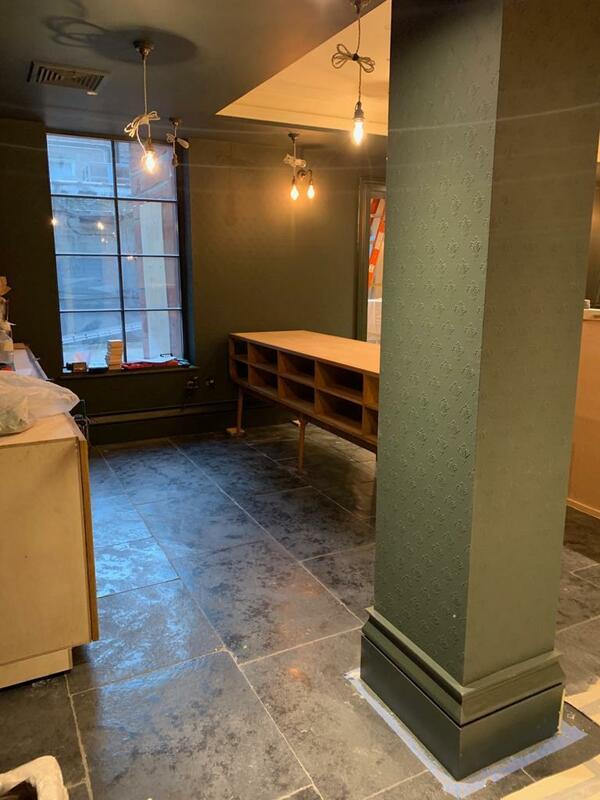 The Classic English showroom is full of colour with Brushed Charcoal Limestone Tiles from our sister company, Floors of Stone. As well as exciting new colours, the showroom is an opportunity to display our first un-painted kitchen range! 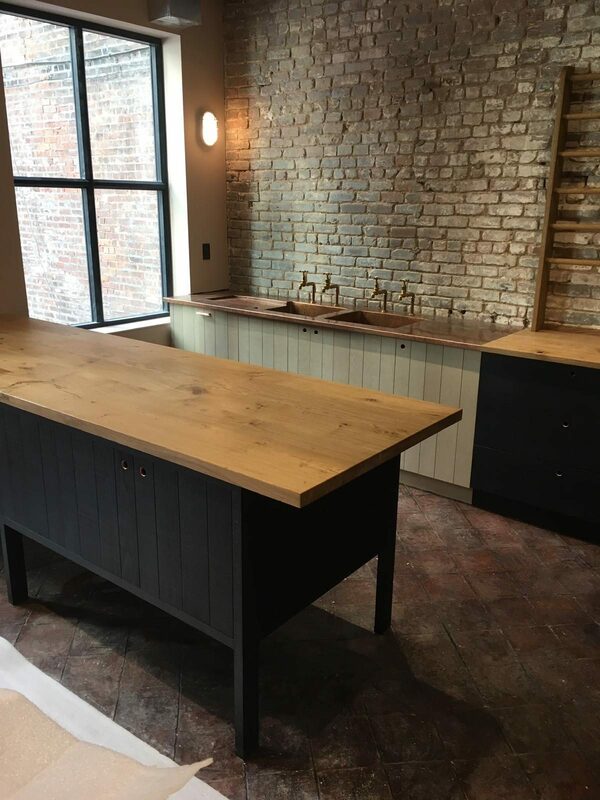 The Haberdasher’s Kitchen is made from natural oiled oak, aged copper panels and lots of glass. This new collection was designed by Paul and launched just last year at Clerkenwell Design Week in London. It is inspired by traditional English haberdashery shops that have been around for centuries. Originally these shops supplied gentleman’s clothing, luxurious rooms of floor to ceiling cupboards, rich wood and dark colours, sliding glass and racks all neatly filled with high quality hats, hand-woven cloths and pure silk socks. In more recent years they evolved into crafts shops, where you go to pick up sewing essentials and beautiful materials. It’s so wonderful to hear people recount lost memories of glass doors and sliding drawers and little oak cubbyholes filled with ribbons and buttons and fabrics and balls of wool. This kitchen has a real sense of nostalgia, and so we wanted the whole room to reflect this. 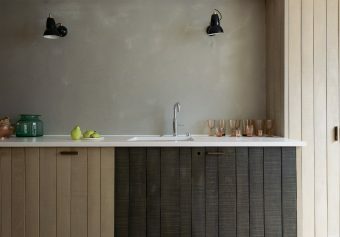 The Haberdasher’s Kitchen combines oiled oak, aged copper panels, glazed drawers and tambour-style doors. The dark green walls are lined with Anaglypta wallpaper. You may remember picking at this textured surface as a kid. It was all the rage from the end of the 19th century right up until the 70’s. Who would have guessed this would come back into fashion? Well, it’s back, and we love it! It gives us that same warm feeling of nostalgia as the kitchen cupboards, yet both also feel luxurious and super stylish. This is one room I really can’t wait to see in person. Anaglypta wallpaper covers the walls of our wonderfully nostalgic Haberdasher’s showroom. Our ceramicists have been busy too! Claire has handmade 500 Emerald Green Tiles to run along a whole wall in the Classic Kitchen showroom. These tiles were inspired by the exteriors of East End pubs, what a lovely thought to be bringing a little bit of London pub culture across the pond. Lots of deVOL Crackle Metro Tiles are currently going up in the Sebastian Cox potting shed too. These slender tiles are a little more subtle, but on closer inspection, you spot the delightful organic crackled pattern. I love that. Lots of deVOL Crackle Metro Tiles going up in the Sebastian Cox potting room. The long and narrow shape of the showroom meant that we have very few windows and so lighting is really important. Luckily, Kat’s delicate Porcelain Pendant Lights look great just about anywhere. You will be able to see an interesting mix of the fourteen different designs she has created throughout the showroom. 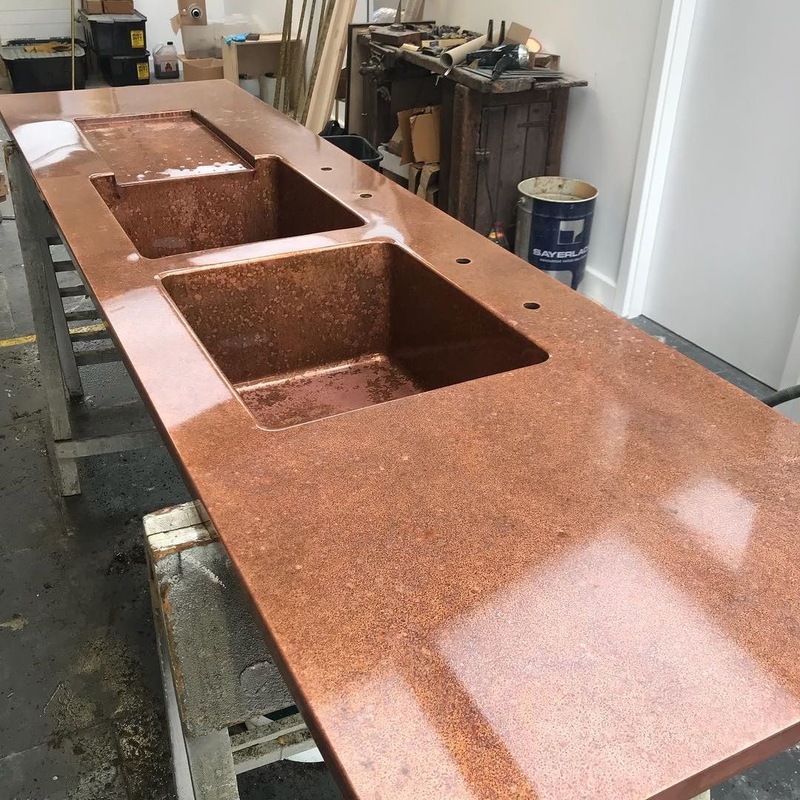 Over in the metal studio, Steph and Holly have created an amazing aged copper worktop for the potting shed at the back – two metres of beautifully mottled copper with integrated twin sinks and a cool hammered draining board, which all run seamlessly into one another. It will sit against a beautiful exposed brick wall, something that we fought very hard to keep. After a lot of meticulous cleaning and brushing and hard work it looks amazing and adds texture and rustic charm to this little space. …And now here it is in the Sebastian Cox potting shed at the back of our New York showroom! Rosie, our resident Decorative Artist, has hand-painted the most incredible botanical backboards, finished with the same crackle varnish as the Crittall-style window to give it a wonderful aged appearance. 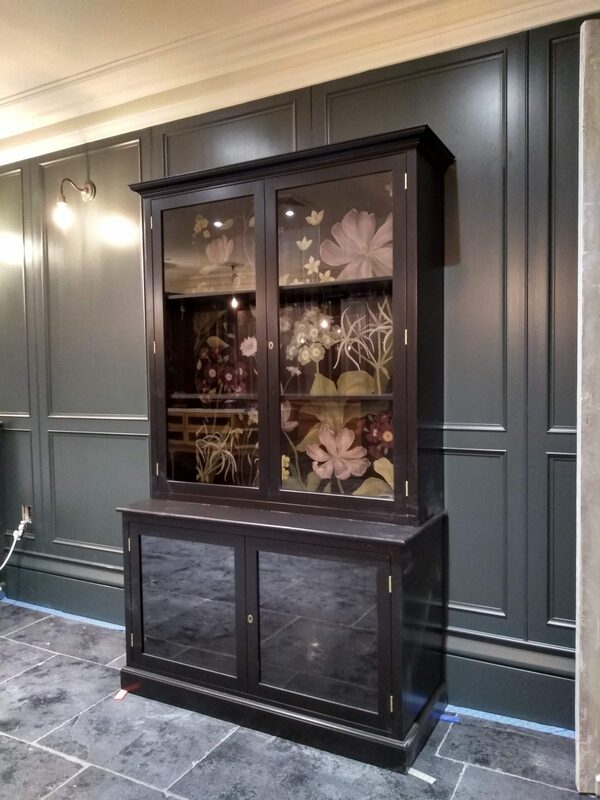 You may have seen this fabulous black Curiosity Cupboard a month or so ago on Instagram, well now it has arrived safe and sound, waiting for Helen to dress it with trinkets and delightful oddities. The Botanical Cupboard, ready and waiting to be filled with unique and unusual curiosities. Much like our Cotes Mill showroom, we are planning to fill 28 Bond Street with a collection of fascinating antiques and vintage pieces from all over the world. Helen and Paul have scoured local antiques fairs and vintage markets to bring you the very best and most unusual pieces for your home, something totally unique that will give your interiors character and soul. We have always loved mixing old and new and enjoy offering our customers something a little different, something you wouldn’t find on the high street. These vintage gems will be in amongst our displays and in our antiques cellar in the basement too, an Aladdin’s cave of hidden treasures to explore. 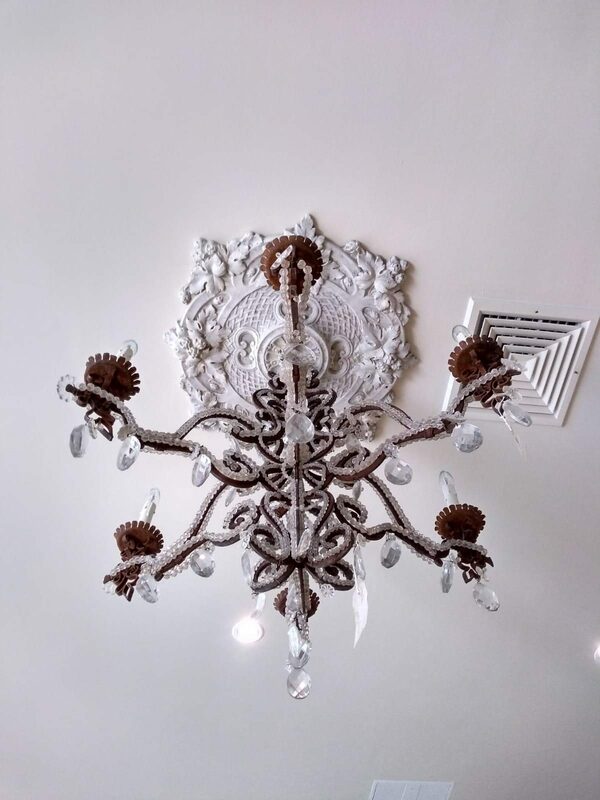 We found this exquisite ceiling rose at a local antiques fair, restored it at Cotes Mill and now it is up in our Classic showroom in New York. Helen and Paul have also been hunting for pieces of original art for the showroom. They’ve found some on eBay, chosen for their style and colours, whereas others have been created especially for us!! One of our favourites, Rebecca Leigh has sent one of her stunning impressionist portraits that will take pride of place amongst beautiful breads and cheeses painted by Berkshire based Katie Wilkins, the loveliest teeny tiny portraits by Carla, a small selection of fantastic still life paintings by US artist Wendy Prather Burwell and delicate floral watercolours by Clare Robinson, who’s actually an old uni friend of Paul’s. It’s a true Anglo/American mix of wonderful independent artists. The beautiful Giclee by @seedofmemoryart, we can’t wait to see her in our new showroom! 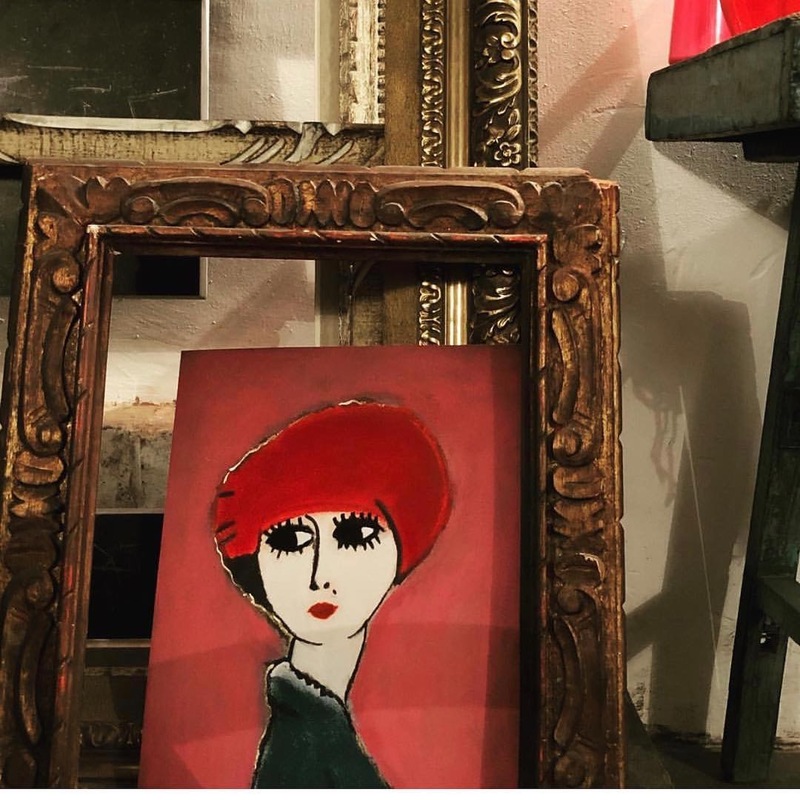 And the art doesn’t stop on the inside, our little shop needed a name so we reached out to legendary decorative artist Sandra Spannan from See Studios to come and gild the windows of our new showroom. Sandra and her team have worked on projects all over the world for huge names like Chanel and Tiffany’s, so we felt very lucky to be able to join their impressive list of clientele. Using the finest Giusto Manetti gold leaf from Firenze, our sign is faceted with matt and mirror for that extra ounce of style. See Studios adding the finishing details to our name, a meticulous and completely fascinating process. 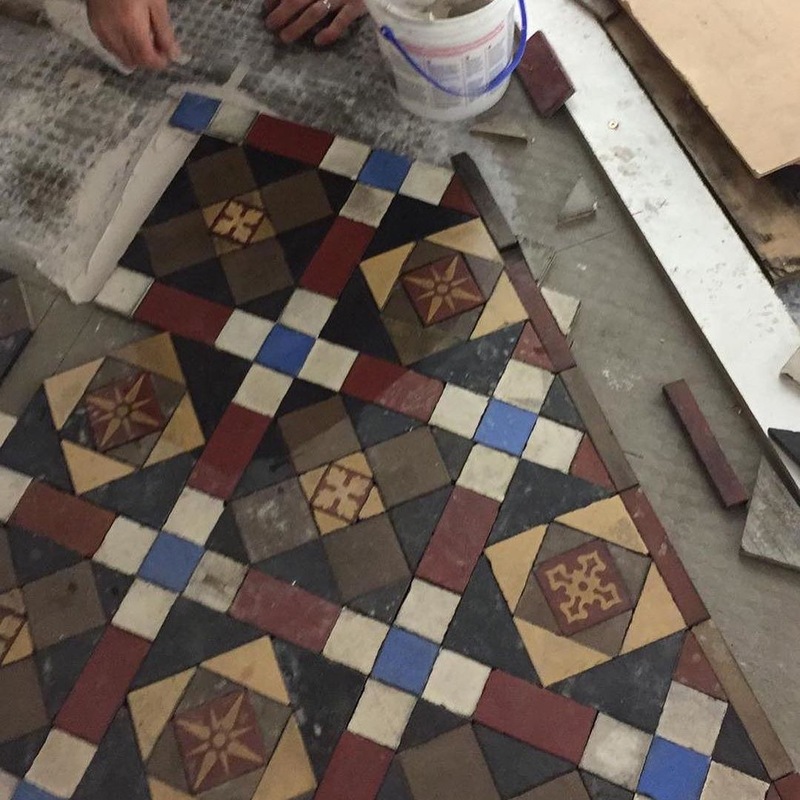 A jigsaw of reclaimed Victorian Minton tiles, laid one by one to create a truly authentic finish. Well, that’s all for now. 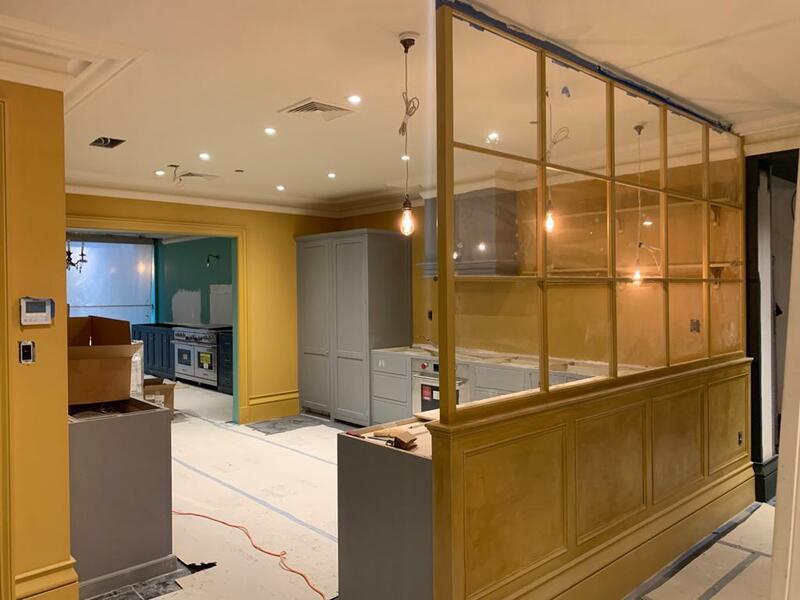 I hope you’ve enjoyed this little update and are excited to come and visit us when we open next month. We are still waiting on the final shipping container so we can confirm the date, but we will let you know as soon as we can!! We can’t wait to show you around. You can find our new showroom at 28 Bond Street, New York 10012. 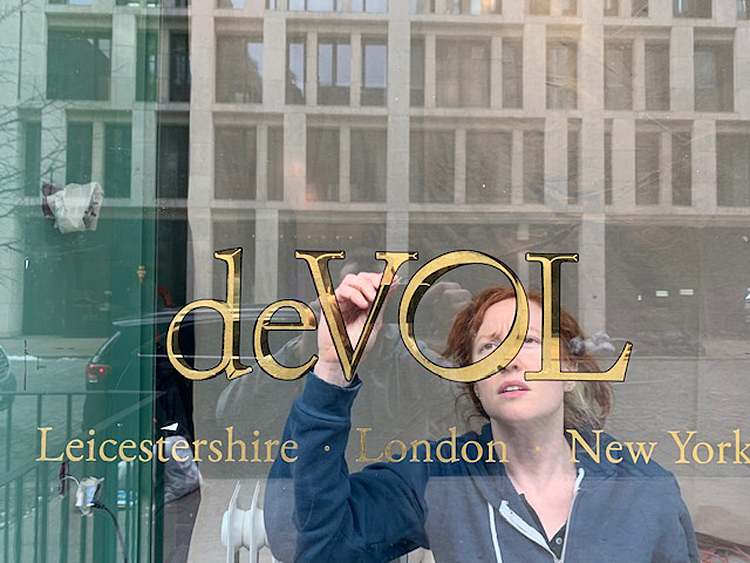 To get in touch with the New York enquiries team, just drop an email over to usa.enquiries@devolkitchens.com or give them a ring on +1 212 210 6269. They’d love to hear from you.